My father recently wrote this letter to his church prayer partners, and shared it with my sister, brothers and me. I now share it with you. You waken from a vivid dream, a nightmare. It's already fading, and you try to will it back; it seems important. Good luck. By the time you're sitting up, eyes open, it's gone. That's the usual pattern for me, at least, but back when I was an unwitting kamikaze pilot more than a half century ago, a technicolor doozie woke me one night, and when I choose to conjure it, it returns easily to wide-awake me, hardly faded. And given the strange logic of dreams, its actions and objects need no exotic interpretation. Its “meaning” couldn't be clearer. We'd been rehearsing its particulars for many months, my squadron mates and I, war babies swept toward Korea and turning into Cold War Menaces; not quite men yet, not yet aces. And we were too busy training, too young, having too much fun, to give much thought to where that training was leading. 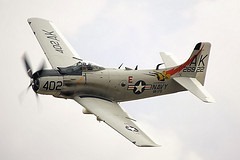 Our slow, powerful Skyraiders had been designed for “close air support,” murdering enemy troops firing at our guys, and blasting to pieces their tanks and mortars. 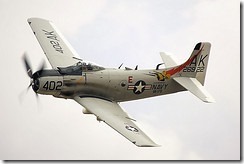 For us, those uses had become our “secondary mission.” Our Skyraiders' primary mission now was euphemistically dubbed Special Weapons Delivery. The weapons were special because, if successfully delivered, each could knock down a city and incinerate its inhabitants if they were lucky, or sicken them with lethal radiation if they were not. A ton of pure evil which could be hung between our retractable landing gear. 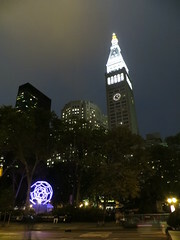 I loved our maps, the color coded spaces between elevation lines, the thin or plumper lines depicting roads or highways, the little barbed ones, railroad tracks, the wavy threads or fat blue strings marking streams or rivers; the dams, bridges, tiny Monopoly set buildings, the church steeples. Cartographic gems, those maps, but our lives hung on their accuracy, and we ruthlessly penciled our radar-evading low level routes on them through the valleys and passes of southern California: distance, time, azimuth from landmark to landmark, no mistakes allowed. A box canyon claimed my friend Kieth. The hours negotiating those routes were exhilarating, exacting, exhausting. Then on to our other rehearsal stage, a two hour flight to a lonely desert expanse a bit west of Death Valley, where we practiced executing The Idiot Loop. We'd fly several miles east, turn back, shove our throttles full forward, drop to fifty feet above the desert, and when we crossed a mock intersection/smoke stack/bridge, we'd push our little red buttons. At x number of seconds after the button push, a timer would ring, and if all went well, we'd pull up, holding a steady 4-G pressure. When our noses were pointing nearly straight up, our dummy bombs would release, and we'd continue our loops until inverted, then roll level, dive back to fifty feet, and get the hell out of there. Or so we were told, and so at the time we believed. * Sounds crazy, doesn't it? O Partner, remember not the sins of my youth or my transgressions. I, my squadron mates, and countless sons of Adam before us had found ourselves on the black, black reverse of Francis's Prayer: Lord make me an instrument of your peace, Where there is hatred, let me sow love. . . . What a hellish nightmare in which to find oneself. Our puny Mark 7's, capable of obliterating mere Hiroshimas, are dwarfed now by the thousands of hydrogen bombs secreted atop today's ballistic missiles, wired to (who knows?) a red, white, or blue button in silos and subs thousands of miles from ground zero. Pray for peace. Work for peace, you dreamer, my Partner dear. *Don't ask me why we so believed. Years later, I and my old comrades had all done the simple math. If our screaming Pratt and Whitneys generated two hundred and forty knots of relative wind across our wings (which mine never did), and a real bomb's six hundred knot shock wave caught us in the rear, as it would, our clobbered Skyraiders would stagger and drop those fifty feet and go boom. **They were so secret that, however we pronounced the Chinese, we could reveal them to no one. 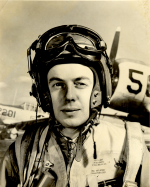 A few weeks ago during our annual Christmas phone call, my friend John revealed that one of his was so far inland that the Navy's cockeyed plan was for him to radio his position (dead reckoning over the Pacific, mind you) to our carrier when he ran out of fuel, parachute into the sea and wait for the helicopter. Skyraider image courtesy of Airwolfhound at Flickr.com.